More data are needed to guide “next step” strategies for patients with generalized anxiety disorder (GAD) remaining symptomatic despite initial pharmacotherapy. This study prospectively examined the relative efficacy of quetiapine versus placebo augmentation for individuals with GAD remaining symptomatic with initial paroxetine CR pharmacotherapy. Adult outpatients with GAD were recruited from 2004 to 2007 at two academic centers. Phase 1 consisted of 10 weeks of open-label paroxetine CR flexibly dosed to a maximum of 62.5 mg/day. Those remaining symptomatic (Hamilton Anxiety Scale [HAM-A] ≥ 7) at week 10 were randomized to quetiapine or placebo augmentation flexibly dosed from 25 to 400 mg/day. For participants receiving paroxetine CR (n = 50), there was a significant reduction in HAM-A scores (baseline mean ± SD = 22.4 ± 4.2 to endpoint mean ± SD = 11.2 ± 6.9; paired t = 12.1, df = 49, t < 0.0001) with 40% (n = 20) achieving remission. Counter to our hypothesis, we did not find significant benefit for quetiapine augmentation of continued paroxetine CR (HAM-A reduction mean ± SD = 2.6 ± 5.8 points quetiapine, 0.3 ± 5.5 points placebo; t = 0.98, df = 20, p = n.s.) in the randomized sample (n = 22) with relatively minimal additional improvement overall in phase 2. 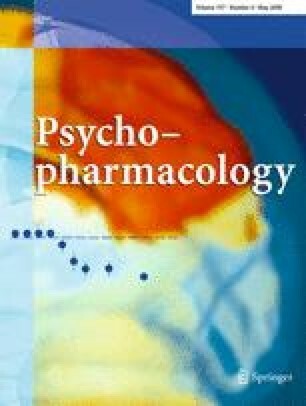 Although conclusions are considered preliminary based on the relatively small sample size, our data do not support the addition of quetiapine to continued paroxetine CR for individuals with GAD who remain symptomatic after 10 weeks of prospective antidepressant pharmacotherapy and suggest that further research examining strategies for GAD refractory to antidepressants is needed. This study was supported by an investigator-initiated Collaborative Research Trial grant from GlaxoSmithKline with additional support provided by the Investigator-Sponsored Study Program of AstraZeneca. Neither AstraZeneca nor Glaxo Smith Kline were involved in the original concepts and systematic review of existing trial evidence, the design, the choice of investigators, the control of allocation schedule, the conduct of the trial, the collection and monitoring of data, the analysis and interpretation, or the writing of the report. Both companies were given an opportunity to review the manuscript and make comments before submission, but edits were at the discretion of the authors. The study investigators have full control of all primary data and agree to allow the journal to review all data if requested. Dr. Simon has received research support from AstraZeneca, Cephalon, Forest Laboratories, GlaxoSmithKline, Janssen, Eli Lilly, Pfizer, UCB Pharma, Sepracor, NARSAD, and NIMH; has served as a speaker for Forest Laboratories, Janssen, Lilly, UCB Pharma, Sepracor, and Pfizer; has served as an advisor for Solvay; and is a consultant for Paramount Biosciences. Dr. Connor has received research support from GlaxoSmithKline and AstraZeneca and is an employee for Merck & Co., Inc.
Mr. LeBeau has no financial disclosures to report. Dr. Hoge has received research support from the National Institutes of Health, the Dupont Warren Foundation, Eli Lilly, Inc., AstraZeneca, Cephalon, Forest Laboratories, GlaxoSmithKline, Lilly, Pfizer, UCB Pharma, Sepracor, and (through fellowships funded by unrestricted educational grants) Merck, and Pfizer, Inc.
Dr. Worthington has received research support from Abbott Laboratories, Alkermes, Aspect Medical Systems, AstraZeneca, Bristol-Myers Squibb Company, Cephalon, Eli Lilly & Company, Forest Pharmaceuticals, Inc., GlaxoSmithKline, J & J Pharmaceuticals, Lichtwer Pharma GmbH, Lorex Pharmaceuticals, Novartis, Organon Inc., PamLab, LLC, Pfizer Inc., Pharmative, Roche, Sanofi-Aventis, Sepracor, Solvay Pharmaceuticals, Inc., UCB Pharma, and Wyeth-Ayerst Laboratories; and has served as a speaker for Bristol-Myers Squibb Company, Eli Lilly & Company, Forest Pharmaceuticals Inc., GlaxosmithKline, Pfizer Inc., Sanofi-Aventis and Wyeth-Ayerst Laboratores. Dr. Zhang has received research support from AstraZeneca, Eli Lilly, Forest Laboratories, GlaxoSmithKline, Pfizer, and UCB. Dr. Davidson has received research support from Pfizer, Eli Lilly, GlaxoSmithKline, Forest, Bristol-Myers Squibb, Cephalon, AstraZeneca, UCB, Janssen, International Psychopharmacology Algorithm Project, and CME Institute; serves as an advisor for Actelion, Pfizer, GlaxoSmithKline, Forest, Eli Lilly, Roche, MediciNova, Jazz, AstraZeneca, Wyeth, Sanofi-Aventis, Janssen, Brain Cells, and Tracscept; receives royalties from MultiHealth Systems Inc., Guilford Publications, American Psychiatric Association, Current Medical Science, and Taylor and Francis; is a speaker for Solvay, Pfizer, GlaxoSmithKline, Forest, Henry Jackson Foundation, University of Hawaii, University of Utah, UNC, University of Chicago, NC Psychiatric Association, Psychiatric Society of Virginia, Texas Society of Psychiatric Physicians, Massachusetts Psychiatric Society, and Duke University Medical Center; and holds equity in Procter and Gamble. Dr. Pollack is an advisor/consultant for AstraZeneca, Brain Cells Inc., Bristol-Myers Squibb, Cephalon, Forest Laboratories, GlaxoSmithKline, Janssen, Jazz Pharmaceuticals, Eli Lilly, Medavante, Neurocrine, Neurogen, Novartis, Otsuka Pharmaceuticals, Pfizer, Predix, Roche Laboratories, Sanofi, Sepracor, Solvay, Tikvah Therapeutics, Transcept Inc., UCB Pharma, and Wyeth; has received research grants from Bristol-Myers Squibb, Cephalon, Forest Laboratories, GlaxoSmithKline, Janssen, Eli Lilly, Pfizer, Sepracor, UCB Pharma, and Wyeth; is a member of the speaker programs of Bristol-Myers Squibb, Forest Laboratories, GlaxoSmithKline, Janssen, Lilly, Pfizer, Solvay, and Wyeth; and holds equity in Medavante and Mensante Corporation.